FORT MEADE, FL. — Pittsburgh Pirates National League MVP and local hero, Andrew McCutchen, returned to his roots in Polk County to host his annual baseball camp for the third straight year. On Saturday, February 1, 2014, Fort Meade opened its heart and baseball fields to a large group of young ball players, who all wanted to learn from Fort Meade’s favorite son, Andrew McCutchen. 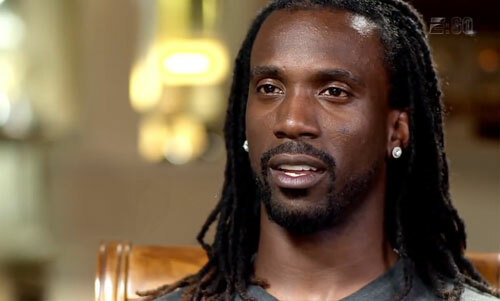 Photo shows Pittsburgh Pirates, Andrew Mccutchen, speaking in a 2013 interview. Over 180 kids traveled from as far as New York for the opportunity to learn the game from their favorite player. Lined up in number #22 Pirates’ jerseys, kids participated in drills like hitting & defense, all trying to emulate their local hero. McCutchen made sure every child that enjoyed the camp didn’t leave without a smile & an autograph. Watch the following video of the brilliant young star who could be the best player in baseball. Nicknamed “Cutch”, Andrew McCutchen currently plays center field for the Pittsburgh Pirates. He was drafted by the Pirates in the first round (11th overall) of the 2005 MLB Draft. He made his major league debut in 2009. In 2012, he finished second in National League batting average (.327) and first in hits (194). He is a three-time All-Star and National League MVP. He is coming off a season where he led the Pirates to the playoffs for the first time in 21 years. If you would like to book athletes like Andrew McCutchen for a speaking engagement, product endorsement or event, contact Andrew McCutchen’s booking agent for appearance & speaker fees.